Note: these lessons are not aimed at any specific age group. Teachers should modify the lessons according to their knowledge of the group they teach. Aims: * to ensure children are familiar with the various structures within the church and the symbols that regularly occur. * to assure the children that they are highly valued as part of the body of Christ. All links provided below for the lessons and materials required for their completion. Downloadable files for completion of lessons. Lesson 5 - Windows - Stained Glass. Teachers can choose to either download a zip file with everything required or alternatively download each item separately as required - see below. *Download this if you do not have access to MS Publisher and therefore are unable to view this document in the zip file. What is the church? Is it just the building? They didn’t have church buildings in the very early years. The Bible calls the people themselves the “church”. Begin with a cardboard box from which one side has been removed. As the lessons continue, build a “church” within the box – the items of furniture, the windows etc and, finally, the people. 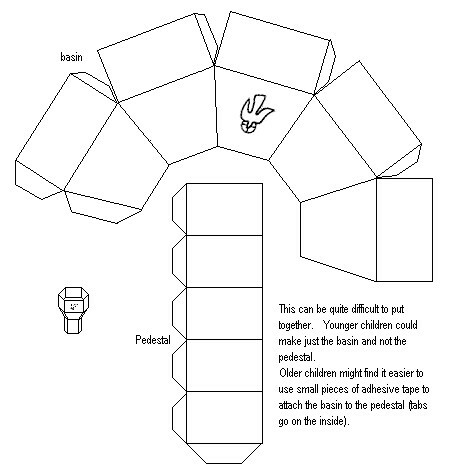 The children can also construct each item and take it home to build their own mini-church. Questions: What is an altar? How is it used? What items are usually on the altar? The altar is the physical focus for worship. It indicates the presence of the crucified and risen Jesus with his people in worship. It is often situated on the east wall of the church, symbolising the light of Christ's return (the rising sun). Its location also symbolises Christ as the head of the church. Candles call to mind Jesus' words, "I am the Light of the World" (John 8:12). When two candles are placed on an altar, they represent Jesus' human and divine natures. Believers are also called to be the light of the world. Candles are also used to symbolise prayer. Bible references: Genesis 22 v.1-14. John 3 v.16. Hebrews 11 v.17-19. Tell children the story of Abraham and Isaac (Genesis 22). Emphasize Abraham’s willingness to follow God’s directions without questioning them, even though it meant the death of his only son. Abraham reasoned that God could bring Isaac back from the dead (Hebrews 11), and God did, in a way, by relenting at the last minute. Therefore, the altar represents the eternal life of Christ crucified and risen. It also represents our eternal life, given by the grace of God, as He granted it to Isaac (John 3 v.16). Colour and make the altar. Discuss where in the church it should be positioned. Where is east? Discuss the symbol of the cross on the altar (the cross symbolises death, the fact that it is “empty” (without a corpus) symbolises the resurrection). What items might be placed on the altar? Candles, gifts of money, bread and wine. 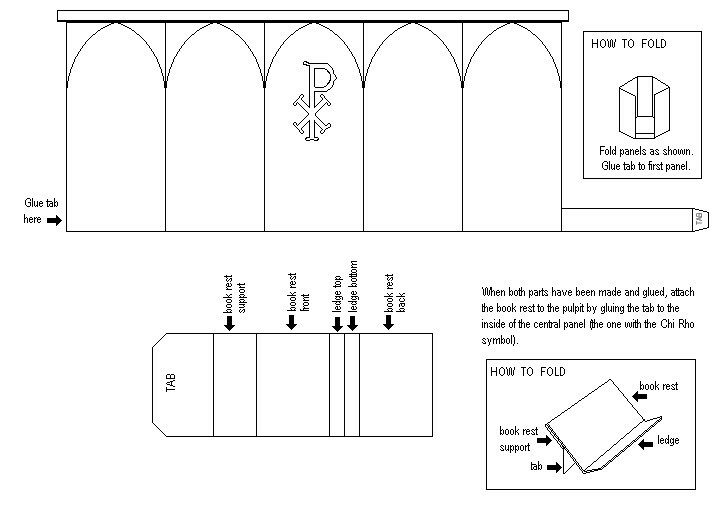 Make altar “cloths” from rectangles of paper or thin cloth. Colour these in liturgical colours and discuss the meanings of each of the colours. Older children may also add liturgical symbols if they wish. Teachers/Youth workers may wish to enhance the children's interest in this lesson on the altar by incorporating our Churchlessontime1 page into this lesson plan where the "children" of St Hilary's Sunday School complete this lesson plan on the altar. Questions: What does it mean to be baptised? Why are we baptised? etc. At first, baptism was normally for adults. It came to take place on the Saturday between Good Friday and Easter Day. People were prepared for baptism by being taught the basics of Christian belief. Reminded of the Good Friday story of Crucifixion, they repented of their sins and were assured that God forgave them. In baptism, they were received into the Church with all the joy of the Resurrection. The custom of baptising babies grew up as Christian parents wanted their children to belong to Christ and be part of the Church. This was particularly important when Christians were being persecuted and dying for their faith. Today, the Church baptises both children and adults. There is no particular age at which baptism is right. What matters is that those concerned believe that it is right to ask for baptism. Most churches have raised fonts on a pedestal, some have portable fonts and others have a font let into the floor where people are baptised by immersion. This tradition follows more nearly the practice of the early church. Some churches have the font at the front so that the whole congregation can witness the baptism, which is usually held during the service. Other churches have the font near the entrance to show that it is by Baptism that one enters the church. Each time the people enter the church they pass by the font and are reminded of their Baptism. Some people also like to dip their fingers in the water and make a sign of the cross in remembrance of their baptism. Having the font near the entrance enables them to do that. Bible references: Matthew 3 v.1-6, 13-17. Matthew 28 v.18-20. Story: Show a baptismal certificate / photos or other mementos of your own baptism to the class. Talk about what happened that day – how old you were, the way you were dressed, the way in which the baptism was conducted and by whom, etc. Emphasize the fact that those who attended the baptism considered it very important. Who is the most important person ever to be baptised? (Jesus). What does it mean for us who have been baptised? Colour and make the font. Discuss where the font should be positioned within the church. What do the children know about their own baptisms? (Some may not have been baptised and will need to be reassured that God loves them anyway and that there is still time). Have children dip their fingers in water and make the sign of the cross on their foreheads. Ask children to find out more about their own baptismal day for discussion during the next session. Teachers/Youth workers may wish to enhance the children's interest in this lesson on the altar by incorporating our Churchlessontime2 page into this lesson plan where the "children" of St Hilary's Sunday School complete this lesson plan on the altar. Questions: What is a lectern? Why is it called a lectern? Why is it (perhaps) shaped like an eagle? How is it used? The Lectern is the desk on which the Bible rests. It is often in the shape of an eagle with out-stretched wings. The eagle is often standing on a ball, which represents the world, while the Bible on the eagle's back symbolises the Gospel being carried on wings to the corners of the earth. Origin of the word “Lectern”: from Medieval Latin lectorinum, and from Latin lector meaning “reader”. In 1794 a ten-year-old Welsh girl named Mary Jones became the first in her family to learn to read. This accomplishment was rewarded when her teacher invited her to read aloud from the Welsh Bible at school. Mary was so impressed by the words she was reading she decided then and there to do everything in her power to buy a Bible of her own. Bibles in those days were not cheap. Many churches actually chained their Bibles to the lecterns to make sure no one stole them. The cost of even a small Bible meant that Mary had to work long and hard to earn enough. For six years Mary knitted socks, grew vegetables, kept bees, raised chickens and helped local farmers harvest their crops, little by little earning the money she needed. She loved Saturdays, especially, when she would visit Mrs. Evans, a local farmer's wife who invited her to come and read the Scriptures at her home. By the age of 16 Mary had finally saved enough money. She had heard that Mr. Charles, the minister in Bala (a place in Wales), had Bibles for sale. Although it was a long, hard journey of 25 miles through a rocky and dangerous landscape, Mary set off, praying for safety as she walked. Mary walked all night but when she arrived in Bala the next day she discovered that only one Welsh Bible was left - and that had been promised to someone else. Mary, who was tired and hungry, began to cry because she was so disappointed. Mr. Charles, the minister, was deeply moved and took pity on her, saying that he had another Bible in English, and his friend could read English as well as Welsh. He then sold the Welsh Bible to Mary. The incident touched Mr. Charles' heart and made him think about the needs of others to read the Bible for themselves. Four years later, in London, he presented the need of the Welsh people for the Scriptures with such eloquence that the Reverend Thomas Hughes, minister of the Baptist church in Battersea, cried out, "Surely a Society might be formed for the purpose! But if for Wales, why not for Great Britain? Why not for the world?" The people who were at the meeting started the “British and Foreign Bible Society”. It is still going today. The Bible Society work to translate the Bible in to every language in the world so that everyone can read the Scriptures in a language they understand. 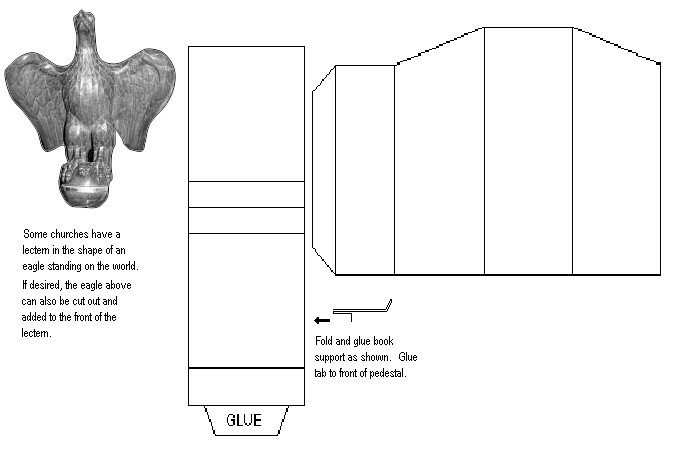 Colour and make a lectern. Does the church building have to have a lectern? Why? Why not? What kind of lectern does their church have? 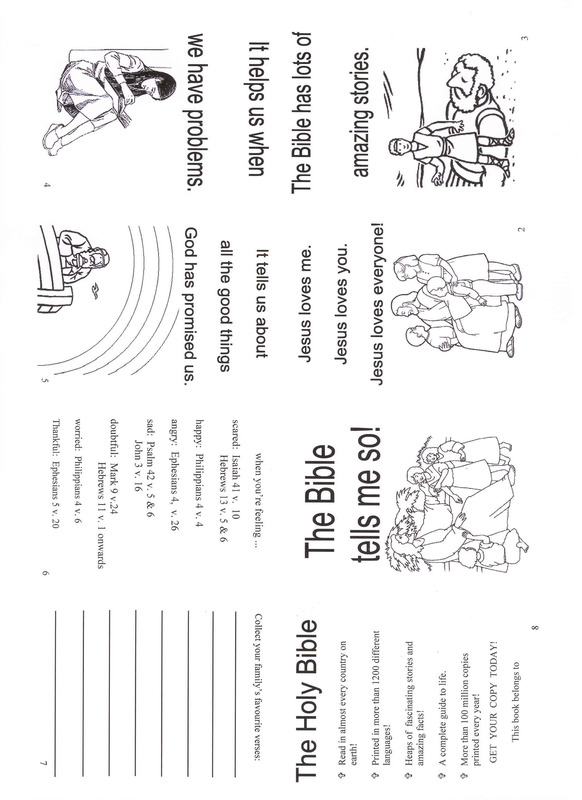 · Make a “mini Bible” using the print-out provided. Look at the lectionary (Bible readings) for the coming week. Practise reading them aloud. Very young children could do this by imitating the teacher. Questions: For what is the pulpit used? What is a sermon? Why is there a sermon at most services? The word “Pulpit” comes from the Latin word 'pulpitum' which means a platform or stage. The Pulpit symbolises the word of God because it is from there that the word of God is regularly preached. It is generally raised up so that people can easily see the preacher. The pulpit is often (at least in older churches) particularly high up to show how important the word of God is. If the priest is high up it symbolises his authority to everybody, and emphasises the fact that God is also watching over the congregation from above. Some also believe that the act of climbing the stairs into the pulpit symbolises the priest drawing closer to God as he prepares to preach God’s word. The Chi Rho (pronounced like the Egyptian city of Cairo) is one of the most ancient "sacred monograms" of Christ. It was developed by early Christians as a secret sign of their faith. It is composed of the first two Greek letters of the word "Christ" (XPICTOC). This symbolises that Christ crucified is preached from the pulpit. Bible references: Exodus 19 & 20. Luke 9 v2. Acts 8 v4-6. Story: Tell the story of how Moses went up Mt Sinai to speak with God and returned with the 10 commandments. Go through the 10 commandments with the children. Describe the way Jesus taught the people (he separated himself slightly from the crowd by climbing to a higher point, getting into a boat, etc). Tell children of the new commandment given by Jesus (Love one another as I have loved you) and discuss it in relation to all the other commandments. What does the Chi Rho symbol on the front of the pulpit mean? For younger children: Why is it important to let parents listen to the sermon without constant interruptions? (the sermon is their opportunity to learn just as Sunday School is the opportunity for children). Interview the priest / pastor about how they work out what to preach each week and why they do so. Interview an elderly member of the congregation. What sermons can they remember best? Why do they remember them so well? 5. Windows: Stained glass. 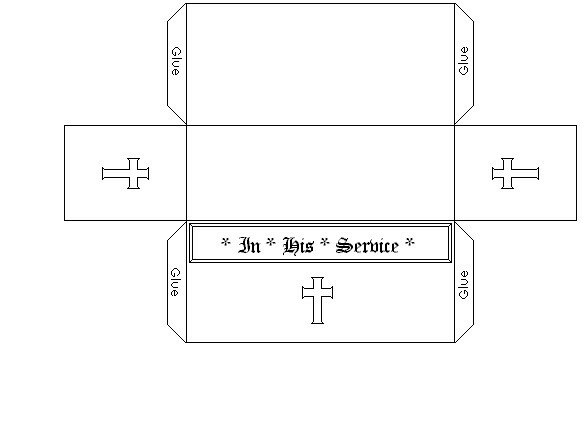 Symbols: Bible stories, dedications to those who served the church etc. Why do churches have stained glass windows? How are they made? Originally it was too difficult to make large sheets of glass so stained glass was an effective way to enclose a window whilst still allowing some light to enter the church. Stained glass served another purpose when people couldn't read or write - it reminded them of the stories and taught them too. Most saints' pictures carried specific objects by which to identify them, eg St Peter, keys. In this lesson, focus on the Bible as one of the most important means by which we learn more about God. Remind children of the previous lesson - that the sermon teaches the people to better understand God’s message in the Bible. Look at the pictures in the stained glass print-outs. Can the children identify the stories they represent? Can they re-tell the stories in their own words? How would the pictures help people who can’t read? 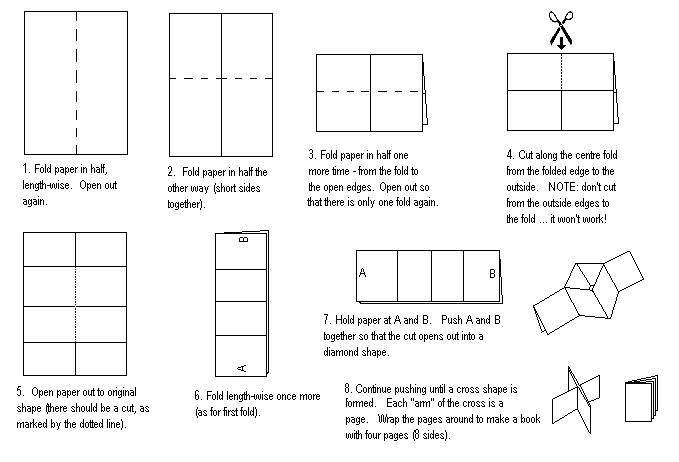 Children colour print-outs (preferably with felt pens) and cut them out. When completed, turn the pictures over and dab cooking oil lightly over the entire picture. This makes them seem transparent. Children can then put their pictures up at home on a window or etc. What about the stained glass in their own church? Sometimes there are memorial inscriptions on the windows to people who have served the church well or been members there for a long time. Is this a good idea? Why? Why not? What memorials exist in their own church? Ask children to design their own window to illustrate their favourite Bible story. Ask children to show their stained glass windows to someone during the week and tell the story that the picture represents. Originally the Nave and Aisles of a Church had no seats; people came to worship God "meekly kneeling upon their knees," and it was not until late in the 15th century that wooden seats were introduced for the congregation to sit in. The only seats in the body of the Church, before the introduction of pews, were stone benches against the wall for the use of the aged and infirm during Divine Service; hence the well-known saving, "the weak to the wall." Bible References: 1 Corinthians 12 v.12-28. Romans 12 v.5. 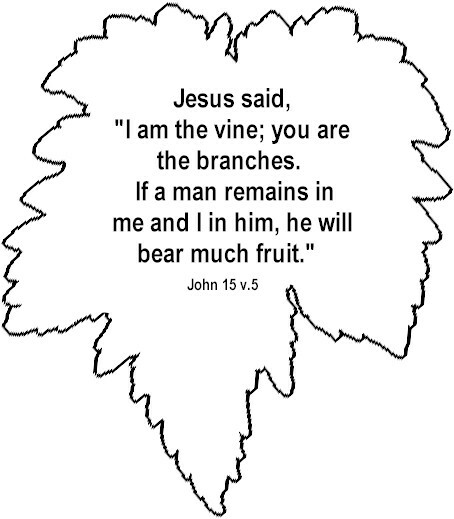 John 15 v.5. Ask children what it would be like to lose part of their body. What is the most important part? As the children give answers, use the following responses. Head: Christ is the head of the church. Without the head we can’t survive. Heart: Christ lives in our hearts. Without our hearts we can’t survive. Eyes: blindfold a child and ask them to perform certain actions where sight is necessary. Ears: mouth actions to children (no sound or gestures) and have them perform them. Arm: Pick up a large box with one arm. Leg: A race: some children use 2 legs, some use only one (hop). Who wins? Hand: Pick up a tray containing (plastic) cups or etc. Foot: children must cross the room on hands and knees, without feet touching floor. Finger: ask children to pick items (eg a heavy book) using certain fingers only. Little finger: describe the way a violinist or flautist uses their little finger to balance the bow or flute. Conclusion: all people in the church are important. We need every single one of them. What can children do to contribute? * Make pews to put in the church so that people can be seated. 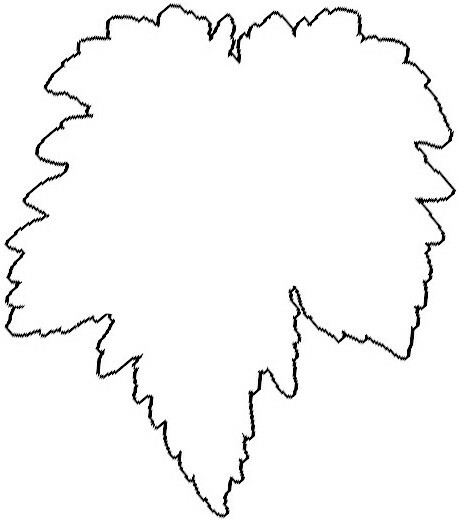 * Cut out a vine leaf shape and write the Bible verse upon it. 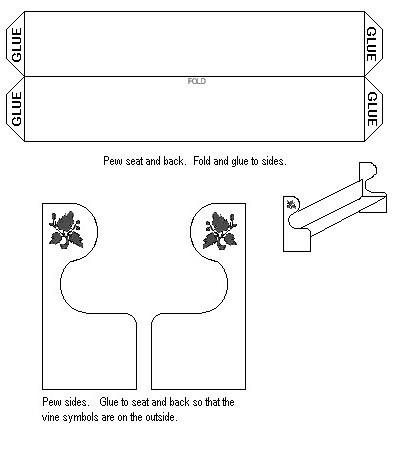 Attach one to each pew in church. * Photocopy the vine leaf shape + Bible verse on to strong card. Make into decorated fridge magnets to give to the congregation, thus reminding them of their obligation to the rest of the church. Why is there a symbol of a vine on the pews? How can children show that they are members of Christ’s body, the church, in their everyday lives? How can the children encourage more children to come to church or Sunday School? Learn a song / play etc to perform for the congregation during an upcoming service. Each child makes a commitment to say “hello” and smile at someone they don’t really know in the congregation – and talk to them if the other person wants to talk.